WELCOME to the online course for selling art. Already signed in? Click here. Discover how to GET YOUR ART in front of QUALIFIED BUYERs and earn an income from the people you’ve already gathered. Learn how to set up your art as a business so that you can reach more of the right people, attract new collectors, and convert more leads into sales. There is no 'right time’ to begin. All you have is now. TASA is a down and dirty look at everything I do, not only to close more art sales but to run an art business like a serious entrepreneur. Learning isn't always a linear process. Below are the six categories I've organized for you to explore at your own pace. Clicking on each of the courses takes you to a category in TASA and lists all the content therein. There are over 275,000 new image creating devices sold each day. This is a great sea of people you need to rise above. Over $4 Billion of art is sold online each year. Do you know how to navigate that ocean to find collectors? Is your art selling now? If you do nothing, nothing changes. So you are selling art, but are you making a living from your art? If you don’t know what you don’t know, how will you? Scroll through the review gallery or see full list of reviews here. Most people think that doing nothing means more of the same… it doesn’t. In six months, or a year, more go life will have gotten in the way. Your motivation and inspiration will be waning and your momentum will be lost. The biggest mistake people make is believing that they just need more time to gather momentum. In business, good things don’t happen to people who wait. Good things happen to the proactive and the productive. “I don’t know what to do?” Inside The Art of Selling Art are tools and tutorials to show you how to do the things you know you need but don’t know how to do. “Can’t someone just do this for me?” Yes, I can help you find an art rep or gallery. But be prepared to pay them half of all your revenue and that’s if they even sell your work. 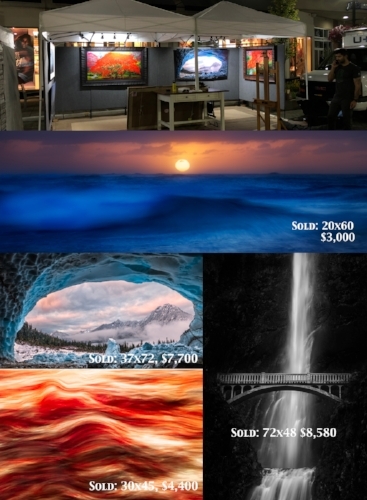 You can join The Art of Selling Art for $495, life time access. You’ll have immediate access to all the content inside The Art of Selling Art as soon once you join. Also, you’ll have access to me and the support of a community of artists at every level to lean on and to learn with. I don’t want unhappy money or unhappy customers. If this is not your best online learning experience, if you’re not satisfied with the quality of the content, or for any other reason whatsoever, simply email me (jason@jasonmatias.com) and request a full, immediate refund… no questions asked. This isn't a traditional class, so much as an ongoing breakdown of how I run my business and approach Marketing, Art Events, The Business of Art, The Administration of Business, and so much more. A lot of my own process of discovery has been experiential. Some of it trial and error. But my success draws from other areas of my business education: I've earned a masters in business, MSOL; have attended countless seminars on marketing, money, and sales in industries including lending, real estate, and SEO; and continue to engage in extensive networking. All of the content in this course is video-based. You'll learn firsthand how to break down proverbial walls that may be holding you back. You'll get an inside look into how I construct actual walls to showcase your art in the best possible light. You'll glean insights for handling the bumps every artist faces on the journey of selling art. And ultimately, you'll come away with more knowledge, tools, tricks and tips that will help you navigate your own successful journey. In addition to the video materials, you’ll have access to our private Facebook group where I keep a close eye on the pulse of the community and answer questions on the fly. Group members include other successful artists and soon you will be among them. I also do weekly Q&A recap videos and drunk Q&A (my favorite). Cheers! What you’re doing here is really amazing. I met Jason at 2017 Redmond Art Festival, and then again in 2018, where we had adjoining booths. He was very helpful in helping me with heavy lifting. During the Redmond setup he made couple of suggestions like keeping the booth space open, so that people don’t feel closed in, to just put my best pieces out for display, draw a diagram of the booth, so that the setup is easy. Further he and Angelina volunteered to help me setup for Bellevue Festival of the arts, at 9:30pm. Based on his suggestions, I came prepared by drawing a booth setup diagram, I had created professionally printed catalog of my available art, bought a carpet for the booth. It was my best show in two years of doing art festivals. I am an artist, a photographer, a veteran, and a teacher. A couple of years ago, FStoppers wrote an article on me about my career in fine art. Questions started pouring in from all over the country so I created a FB Group. There weren’t enough hours in the day to answer all of the posts. Ultimately, that group prompted me to create this course. Conduct business side-by-side with me. The Art of Selling Art is not taught at the theory or class room level, it’s shared at the application level. I show you what I’m doing, as I’m doing it, so that you can apply these same strategies to your art business.